He'd never guess that his very courage to commit could be the cause of his own downfall. Jake's loved and lost, suffered failed relationships and felt real sorrow, but the new girl in his life may just be the one to finally put an end to that life. His girlfriend Samantha is sweet and kind, full of joy, and the kind of girl Jake can be perfectly content sitting in complete silence with. It's so comfortable, so easy, to fall completely for her. In fact, Jake would do anything for Samantha, anything at all. Just returned from attending Samantha's family reunion, Jake's high as a kite, basking in the realization that he's been officially accepted as one of the family. He can't believe his luck, especially as he's driving off into the sunset with Samantha herself and so looking forward to those precious, anticipated moments alone with her. What could possibly go wrong? Thump thump resonates from the trunk of the car as they speed along the highway together. He falls head over heels for her... but not exactly in the way he intended. When I started reading It Gets Easier, I was expecting something similar to the last book I read by her, Last Shot. In some ways, I was right. But mostly, I was wrong. It Gets Easier starts out with a hopeful tone, a boy and a girl who are having fun and flirting. In my opinion, the beginning was way too fluffy for what was truly going on, but I digress. I thought that the relationship between Jake and Samantha was poorly developed. I saw their relationship as nothing more than words on the page, but it didn't hurt my overall enjoyment of the storyline. My true enjoyment came from the twist, right in the middle! Let me tell you, Justine can write a twist! I was really surprised. There were some hints leading up to it, but I thought they were just jokes! I never imagined it would go there, and that's why I'm giving this book four stars. 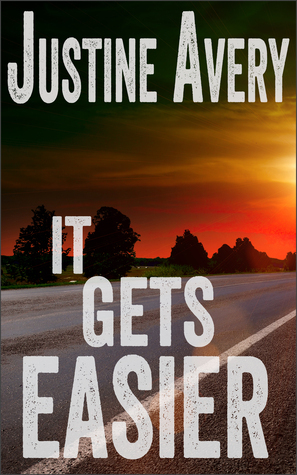 I think that Justine Avery writes some of the most interesting books - there's always an unexpected ending, and they're so short and refreshing. I would recommend this book for people who are interested in a short read with a twist ending. Today is the perfect day to die. Bernard is the type of man that accomplishes all that he sets out to—and easily. He's intelligent, hardworking, and completely unfamiliar with failure. His only complaint—the singular source of the inner anger bubbling within him—is that no one else in the world recognizes that. It's time to force them to. Bernard's had enough. Enough of the complete absence of respect in his life, of being looked down upon, of being the only person in the world—it seems—who truly sees the reality of his life and what he deserves acknowledgment for. In fact, that recognition is way overdue. And that makes Bernard's blood boil. Today is just like any other day; Bernard has planned and prepared for every aspect. His heated rage stews just under the surface, just more fuel for the fire. He will accomplish this one goal as he has all others. Another success, his ultimate success. And he'll have made his blissful escape. The final statement will be Bernard's. At last. The perfection of the execution of this one, final achievement will be undeniable. Bernard will be free of this ridiculous world—passing calmly from his lifetime of frustration—and the world will realize its significant loss. They won't be able to take away—or look away from—what he's about to do. If he succeeds. But of course, he will. Why wouldn't he? He always has. He's dead set on killing himself, as many times as it takes. When I started Last Shot, I wasn't expecting a whole lot. This isn't my usual genre, and I don't "love" novellas; so it was a heck of a surprise! The story follows a man named Bernard through his suicide attempts - intriguing, right? At first, I was very hesitant. The main character, Bernard was very unlikable. He even goes so far as to proclaim himself perfect! That really angered me at first, but I think the author was trying to show the many sides of depression, anger and suicide through him. Towards the end, I was even beginning to think that he was bipolar - there are several layers to the character & his predicament. I found him to be harshly identifiable, because I could understand him and his problems but it didn't make me like his character any more. The book is written in third person, which I found to be very helpful in forging a connection with the main character in such a short time. I would like to say that it is a bit hard to get into at first, but you get used to it after a short time. It's a very unique writing style! You start out thinking that things will happen one way, and towards the end there was a twist that just made the story for me! It was so unexpected! I'm not going to tell you because of spoilers, but it was such a shock! I found Last Shot to be an interesting read that quickly and efficiently showed many types of mental illness and how they can affect anyone. It showed alcoholism, depression, and anger. It also showed how the perception and judgment of the people around us can affect how we feel about ourselves. 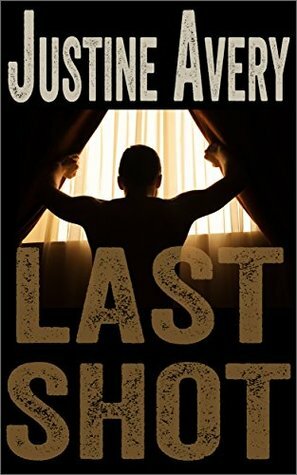 I would recommend Last Shot to anyone who wants a quick and interesting read. It's been a while. I miss this - this blogging thing. I just wanted y'all to know that I haven't completely forgotten about you - even though it may seem like it. And I hope I can come back to you, sometime soon. I'm currently working on a new project, and I'm working nights, but I have some hope that I'll be starting up again eventually. Thanks for hanging in with me. = I didn't like it. According to FTC guidelines, I am to state that all books that I review on this blog are from my own bookshelf, from the library, or borrowed from a friend. In the event that an author or publisher sends me a book, I am not compensated in any way whatsoever for my reviews. They are solely mine, and thoroughly honest.